Defense Secretary Leon E. Panetta heads to this weekend’s NATO summit prepared to confront Pakistan over what he considers price-gouging for transport of supplies to Afghanistan and hoping for a “consensus” among allies over the war effort. In an interview before his arrival in Chicago, where the summit is scheduled to begin Sunday, Panetta all but ruled out paying Pakistan $5,000 for each truck carrying supplies across its territory for NATO troops waging the Afghanistan war. Pakistani officials have demanded that amount as a condition for reopening supply routes that have been closed to the alliance since fall. 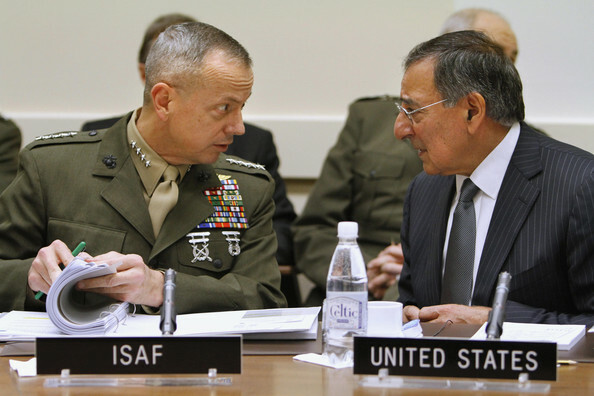 “Considering the financial challenges that we’re facing, that’s not likely,” Panetta said of the demand. Before the supply routes were closed in November after a mistaken U.S. attack on two remote Pakistani border posts that killed two dozen Pakistani troops, NATO convoys were paying an average of about $250 a truck, a senior U.S. official said. U.S. officials say they remain hopeful they can resolve the dispute, perhaps at the summit. Pakistani President Asif Ali Zardari accepted a last-minute invitation to attend the meetings, although he is not expected to meet one-on-one with President Obama, officials said. Thousands of trucks a day carrying supplies would go through multiple border crossings from Pakistan to Afghanistan, making the fees a potentially massive source of revenue for the cash-strapped government in Islamabad. The U.S. has shifted deliveries to different routes through Russia and other countries to Afghanistan’s north. But the massive withdrawals of equipment due to unfold over the next 21/2 years as troops leave the country will be “significantly” more difficult if routes in Pakistan aren’t used, the Pentagon acknowledged in a report last month. The Obama administration hopes the two-day summit will highlight what Panetta called a “consensus” within NATO about how to disengage militarily by the end of 2014. Exhausted after more than a decade of war, the U.S. and its allies want to hand off responsibility for fighting the Taliban to Afghan President Hamid Karzai’s government, even though its army and police remain well short of being able to stand on their own. “Everybody in the alliance recognizes that for this to work, we can’t pick up and leave. We’ve got to remain there to provide support and to assist them in that effort with training, with assistance, with advice,” Panetta said. But he acknowledged that there would be difficulties, both on the battlefield and within the alliance. Those splits are exemplified by the new French president, Francois Hollande, the Socialist Party leader who campaigned on a vow to withdraw all 3,300 French troops by the end of this year. Hollande met with Obama at the White House on Friday. Panetta, who plans to meet the new French defense minister, Jean-Yves Le Drian, in Chicago, indicated that the U.S. hopes France will agree to keep some forces in a noncombat role in Afghanistan for the next 2 1/2 years, even if they withdraw all combat troops early. Yet a more rapid exit by France than planned could lead other allies to speed up their own troop withdrawals. “There are some countries — Canada, France — that want to bring their combat operations to an end on a faster time track, but that doesn’t have to mean they won’t accept the responsibility to continue to provide the needed support,” Panetta said. Panetta acknowledged that U.S. efforts to persuade other countries to make long-term financial pledges to fund Afghanistan’s army and police, a key objective of the two-day Chicago summit, is running into difficulties. In an effort to secure more pledges, the U.S. is asking other countries to commit to providing aid for only three years, though Afghanistan’s armed forces are expected to need foreign assistance for at least a decade, a Western diplomat in Washington said.